Before and after pics of a partial restoration of alloy wheels where sanding was feathered beyond the lug nut area followed by a full whole wheel restoration of a similarly corroded canyon wheel/rim on the right. The before image is after stripping the factory polyurethane coating. 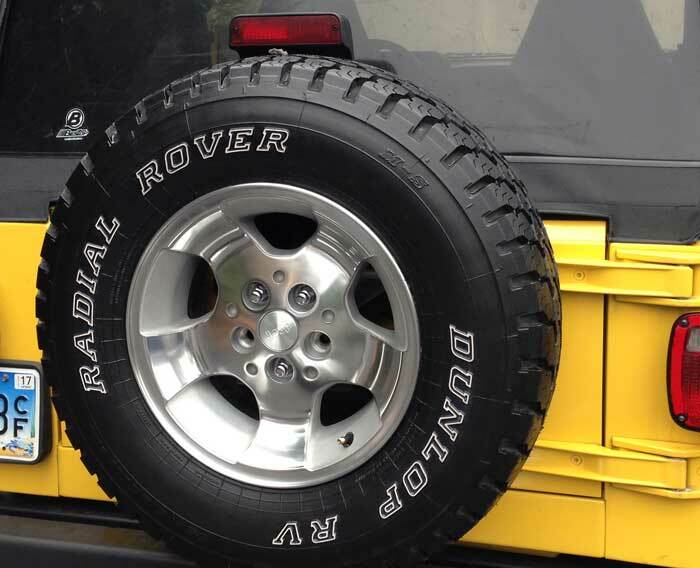 Here’s a do-it-yourself (DIY) method for restoring corroded aluminum alloy wheels to a mirror-like shine using the popular stock canyon rims of the Jeep® Wrangler TJ, as well as the original aluminum alloy wheels on a 2000 Honda® Odyssey. Detailed steps can be modified for other yard and garage aluminum restoration applications. Maybe I should stick to horticulture, but I love my Jeep® Wranglers. And now I love their canyon rims with a whole new look. Originally painted black by the previous owner because it was so corroded and pitted in numerous areas, I restored this entire canyon rim using these methods after the black paint was removed with acetone. Mounted on the back so some lugs are missing. Even though the “canyon” rims are a common stock rim for Jeep® Wrangler TJ, the shine achieved by this DIY restoration process really makes them uncommon. Not only will they look new, but the canyon alloy wheels will look really different with a mirror-like shine in addition to the machined aluminum look between the spokes — better in my opinion. This difference could be enhanced, of course, by painting the unpolished regions to make unique combinations. What do you think? And let me know what ways you find that work better and I’ll update. I’m planning a video, if there is interest. Several existing YouTube® videos were helpful that show removal of the alloy wheel’s polyurethane coating with stripper and the sanding or polishing of aluminum via different methods. But nothing this comprehensive and soup-to-nuts that I could find. them at the very end of this post. But, you can make them like new with a mirror-like finish by simply sanding with an inexpensive low-speed sander-polisher across a range of increasingly finer grits and then polishing with aluminum metal polish. Then either crystal-clear-coat them or keep them polished and waxed. Each wheel takes several hours and some effort — effort made a whole lot easier with the right power tools. You may already have a lot of the tools and materials, but I’ve also researched the best value tools and materials readily on Amazon.com®, most with 2-day shipping. Let me know if you find better ones. Here are the high-level steps that I did. These will be followed by some explanation and then by the same outline with all the details, my own lessons learned and best practices that I found in the method to help you do DIY right the first time around. Restored whole canyon rim — sanded with 150 grit between the polished spokes — protected with wax. Disclaimer: I’m not an auto-industry professional. On the other hand, if can do it without any prior experience and some arthritis in my shoulders and elbows, then so can you. Obviously, use these steps/ideas at your own risk, both from a personal property and health standpoint. Wear old clothes you wouldn’t mind being ruined. Be sure to follow all manufacturer labelled directions and warnings even if I do/did or not. A high quality dust mask is key and I didn’t do any sanding without it! Of course, safety goggles, ear protection and protective gloves will be needed. A kneeling pad, for sitting and kneeling, and/or knee pads are helpful. I’ve tried to think of everything, but you’ll need your own common sense and a working knowledge of working with automobiles, tires, jacks, power tools and etc. Each wheel takes a few hours and there is some cost for the sandpaper, tools and other materials you don’t already have. A fairly complete list of recommended items is at the very end for items you don’t have. It’s not-too strenuous with the right power tools. I’m a 5′ 9″ 163 pound 50-something male with arthritis in my shoulders, elbows, knees, etc. I actually found it therapeutic — feeling better in the days following than I had in a long time. So, if I can do it, most can, especially if you pace yourself. The first “After” photo is a partial job where I feathered the sanding out just beyond the lug holes. The bottom photo is my first whole rim job. I did dry sanding, The flexible pad with hook & loop attachment of sandpaper that I will recommend made it easy to feather into spots. Before and after of same wheel from my 2000 Honda(R) Odyssey, including a new Honda(R) center cap. The before image is after stripping the polyurethane coating. Using a low-speed sander-polisher is key. On my first attempt, I made the mistake of trying a dedicated 11,000 rpm grinder that I had on-hand. It shredded the pad on the first wheel. So, I bought an inexpensive variable-speed 1,000-3,000 rpm sander-polisher. There’s little sign of wear on the pad after doing multiple alloy wheels and the sandpaper lasts well too. Sure, a cord-powered drill could be used, but I expect it would bounce around the rim too much and be more tiring to control. A sander-polisher you stability and the proper angle. You also want to be able to set-it-and-forget-it on the low speed, which the sander-polisher does well. Note that each step is key! Before removing, mark position on tread of tire with a permanent marker and/or take a picture of its position relative to lettering on the tire. Preferably jack car so tire can rotate. I recommend use of jack stand(s) and wheel chucks on an automatic in park on level ground for obvious safety reasons. If jacked, to get around the issue of protruding lug nuts, remove all but a single lug nut or other nut that size that does NOT extend beyond the wheel’s surface, for obvious reasons, and don’t’ forget to put the other lug nuts back when done before lowering the jack. Spinning freely is best, but not necessary. I was able to achieve this by mounting on the rear of my Honda® Odyssey in park. On my automatic TJ, the front wheel turns in park with effort (not with sanding), which is good enough. Alternatively, working with the tire off and on the ground works too. But bending over the wheel is less ergonomic for me. I’m don’t know what you could do safely with the tire on a manual transmission vehicle. So this may be your only option if your tires are too big to fit on another suitable car. It does, however, get around the protruding lug nut issue. If the valve stem is longer than most, consider yourself lucky — you can carefully push it back and put a stick between it and the insides of the wheel to keep it out of the way. Otherwise, you may just need to be careful to avoid it — but, make sure your tires have enough air to start ;-o). I sanded a couple of them shorter before I clued-in. But, they still took in air with a bike-pump. Tires — unless replacing your tires, you may want to mask them or have them removed from the rims. I didn’t worry about that and had only minor effects on the tire surface. But, it is possible that the stripper used below, which can drift and/or run, could leave marks or hurt white lettering if it gets on it (didn’t on mine) or that sanding could scuff them if not careful It is important to wash-off any stripped polyurethane from the tire before it dries or it may have to be stripped-off later. I use a degreaser to remove wax, dirt, and road-film — you don’t want to sand that stuff into the metal or gum-up your sand-paper. Rinse well and let dry — hitting it with a leaf-blower speeds-up the drying process. I don’t think it will look good to strip only part of the polyurethane even if you only have to sand the inner part. I stripped the entire rim. NOTE: I didn’t do the back of the wheel, but you might consider doing that at the same time and then clear-coating the back after the last step regardless of whether you wax or clear-coat the front. Some clear-coat will come off the back rim anyway from over-spray if you use the stripper spray. I sprayed with premium polyurethane “Stripper”. Plan on about 1 can for every two tires. I didn’t do it, but you may also want to spray the back side, as well, because some stripper will get through to the back and take off part of the polyurethane coating anyway. You’ll want to use a crystal clear coat on the back side, regardless whether you polish or coat the front, because it is too difficult to polish and wax the back on a regular basis. Leave on for a good 15 minutes. You may even see in come off in sheets. Wet the tire rubber first and then hose or power-wash-off the stripper, including any residue off the driveway or any other valuable surface. Rinse, dry & repeat, as needed to remove all of of the polyurethane coating. Be sure to where a good dust mask & safety goggles. Heavy gloves are also recommended. I found that 100 grit sand paper taped onto a cone-shaped polishing attachment via a drill, gave a nice machined look that contrasted with the outer polished areas that looked especially great after waxing to protect and putting in brand new lug nuts at the end. Look out for the sandpaper coming loose. Wrapping it in the right direction (direction the drill turns) will minimize this. For a machined look between spokes, sand those areas with coarse sandpaper (80-120 grit) in the same horizontal direction. NOTE: Originally, when I did my wheels, I sanded between the spokes AFTER the next step. But it’s better to do this step first to avoid scratching those smooth-sanded areas. Folded sandpaper squares work well for large areas. Spiral sanding rolls/cones work best for tightly curved hard-to-get-to inner areas. Again, be sure to where a good dust mask & goggles. Heavy gloves are also recommended. I think it looks best to sand the entire smooth surface of the wheel like I did in the 2nd AFTER picture and subsequent pictures above. I used an inexpensive variable-speed 1,000-3,000 rpm sander-polisher at 1,000 rpm (sometimes 2,000) in one direction concentric with rim. In the first AFTER picture, the wheel was only corroded in the middle, so I feathered-out my sanding just beyond the corroded center area in the “After” picture shown above going out just a little further each time with increasingly finer grits. I think it looks even better to do the whole smoothed area of the wheel though. But, that is more work. NOTE: A high speed grinder (e.g., 11,000 rpm) will shred your sanding pad. They say it is best to start with the highest grit that will remove the problem(s) and every subsequent grit used thereafter is to smooth-out the scratches left by the previous grit. If you can still see the pitting or ribbing (stock canyon rim surface texture) after a few passes, then either keep sanding or step down to a lower grit. To find the highest grit that still worked to remove the corrosion damage, I experimented with the worst wheel on my old 2000 Honda® Odyssey that had heavily corroded areas. Starting with rubbing compound did almost nothing to remove the pitting. I thought starting at 400 grit would do it. But when it was all done ending with 2000 grit, I could still see the ghosting of the oxidation damage where it was worst when I was all done and I wished I had started with 80 grit and patiently worked through each subsequent sequential grit to 400 before going through to 2000. Nevertheless, it was good enough for my old minivan not to do it all over. But, I recommend starting at 80 grit if your wheel is heavily corroded or deeply scratched. That is what I did on subsequent minivan alloy wheels. You don’t want to get to the end and still see scratches and the ghosts of corrosion. If you start at a grit higher than 80 and find that it is not removing all the lines or is taking too long (or using more than one sheet of sandpaper at the same grit) then back-up to a lower grit until it comes off fairly easy. To efficiently remove the groove texture on all over the smooth surfaces of the Canyon rims I had to start with 80 grit even though that seems harsh. But, a couple or three passes with each subsequent grits listed below produced a smooth almost scratch-free surface that polished to the mirror-like shine you can see in the pics. (A) Hit the very worst areas first, especially dings and such to smooth those first with your lowest grit used. (B) Do the ribs, noting which part of the wheel you start on, like the rib next to the valve stem, or you’ll end-up duplicating effort unnecessarily. My best practice was to put my leg against the wheel to keep in from spinning and start at the top of each spoke and go down with the pad with some bend in it at 1,000 rpms and feather off at the center of the wheel. Then turn the wheel a little and go down the flat surface between the ribs. Then do the next rib and so on all the way around. Repeat one or two more times all the way around and do the outer part of the wheel and any other areas you want smooth before going on to the next grit. (C) You’ll also need to do the outer areas of the rim. You may need to sand the outermost part by hand to avoid scratching the tire. Be careful not to hit the tire or areas in between the 5 ribs/spokes. NOTE: Some YouTube videos recommend having the wheel spin while sanding and working your way down from outer to inner. Except for the outer rim areas where it was helpful, I did not find letting the wheel spin freely to work well on these alloy wheels having 5 large ribs/spokes — it left noticeable concentric waves. 800, 1200, 1500 and 2000 grits, all for use on a 6″ flexible backing plate or pad. Start with a brand new sandpaper disc in each grit-step even though your disc should still be capable of sanding after the few passes you’ll need for each grit. Otherwise, expect to still see scratches from a previous grit when you are all done. If you see browning that remains after repeated passes, then you probably need a fresh piece of sandpaper. Repeat steps A to C and with each sandpaper grit all the way up to 2,000 grit. The last step will likely smooth some of the areas that you sanded in the previous step with coarse sandpaper. Re-sand those areas with coarse sandpaper for an even machined appearance. I used Mother’s® Mag & Aluminum Polish on the same areas sanded with the sander-polisher using a Black & Decker® WP900 6-Inch Random Orbit Waxer/Polisher to which I added Velcro® in order to use Meguiar’s® DFP6 6″ DA Foam Polishing Disc for hook & loop polishers. Be sure the pad is pre-moistened with water. Wipe blackened excess with a clean cloth between polishes. Rinse (pad and wheel) and repeat several times until achieving desired shine. Pad should be rinsed between repeats. I put a little dish soap in the rinse water. Repeat, as needed, to desired shine. Don’t place any cover over the foam polishing disc mentioned above — it works fastest all by itself using the polish. Use these tools and polish for touch-ups in the future too unless you top with a crystal clear coating. Either wax all wheel surfaces (used Mother’s® carnauba wax over the entire wheel) or degrease and coat with crystal clear paint. Regardless of which you do to the front, it is probably a good idea to use crystal clear paint on the back side of the wheel if you stripped the polyurethane away. I haven’t tried this yet, so let me know what you recommend. lug nuts to recommended specs. Center cap for my Honda® Odyssey rims. WARNING: Be careful NOT to let harsh tire cleaning solutions, especially any containing bleach, get on your finished uncoated wheels. Wax will probably not protect them from that and you’ll probably have to re-polish. One particular method that looked the most promising for a quick fix uses the Nylalox® aluminum oxide coated nylon brush used in a method mentioned on www.WranglerForum.com. But, the aluminum oxide-infused nylon brushes I tried (80 grit coarse and fine) did NOT provide a quick-fix. Both scratched the aluminum much like sandpaper — they’re just not supposed to wear out as fast as wire brushes. But, they would be useful to target small areas that are hard to reach with the 6″ circular sanding pad I used. And I can see why they’d be useful on the convoluted aluminum pattern of the alloy wheels shown in the method linked above having many places a pad might not reach. They might also be more selective at removing the softer oxidized aluminum with less scratching of the surface. But, I question whether they’d remove the pitted surfaces from heavier corrosion that I encountered — pitting I removed efficiently with relative ease using equivalent grits of sandpaper on a sander-polisher. myPlantDr.com is a participant in the Amazon Services LLC Associates Program, an affiliate advertising program designed to provide a means for sites to earn advertising fees by advertising and linking to Amazon.com and Audible.com. Hey man…I just picked up a set of used Canyon rims with 31×10.5 pro comps for my 97 TJ and mounted them last night, what a difference over the stocks that were still on there. This is definitely the process I will be using to restore to the potential…yours look fantastic!! And thank you for putting this out there!! Did you ever put together a video for this? Darren, sorry to take so long to approve your post. I took video of the process but haven’t had a chance to edit it yet. Thanks for the feedback! That has me inspired to edit the video, hopefully soon. I keep my Jeep in a garage at night but the wheels still look good even after the winter with only a little spray waxing a couple of times. So, I really have been happy with them–it’s a lot of work but it gave the classic Canon rims a unique look that you can’t get any other way. I hope you post or send some pics of your restore. Let me know if you have questions. Hi. I was wondering if I go the waxing route do I have to continuous wax them to keep shiny? Or is clear coating a more effective way to go? Can you wax and clear coat? Allison, here’s what I know. I have not tried clear coating. I keep my TJ in a garage in Maryland all winter when not driving to work, etc. I’ve given it a light spray wax once or twice since the fall and they still look great. You can’t use harsh cleaners, like the kind used to clean grime off the black-walls. But, the wheels on my Honda Odyssey that I first experimented on and have pretty much let go since without keeping in a garage are starting to corrode again. So clear coating is probably the best way to go if you don’t have a garage for it and don’t want to do a little spray waxing after a wash every month or so. You could wax them AFTER clear coating but it is critical to get wax and grease off before you clear coat. Hope that helps. 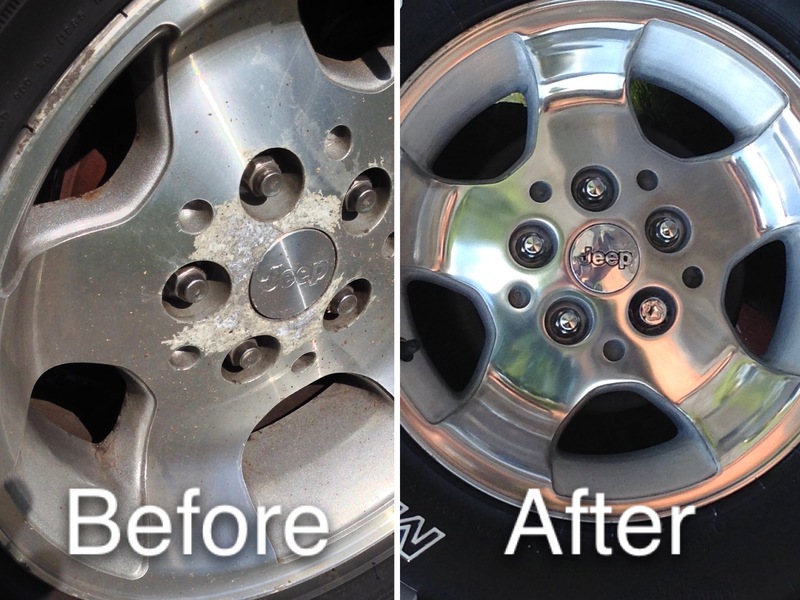 Em, After the wheels are restored, apply a protective clear coat that is made for aluminum. You can find one online or in an auto parts store. But while a DIY repair such as Richardson’s is fine for mild damage, you’re probably looking at calling out a mobile wheel refurbishment company to repair anything more serious such as a bent wheel, extensive kerbing, corrosion and fractures. Thanks so much for this – I’m working on some Mercedes CLK wheels and would love to restore them in their origina aluminum but the work involved makes me sometimes question if powdercoating is just an easier solution . One question I have that you hit on that no one else seems to every discuss – the back of the wheels and the clear coat or coating that comes on the wheels. As you mentioned, some of the coating on the rear of my wheels came off due to overspray with the stripper…do people really also strip the back and shoot with clear? Ugh, what a pain. And is it really clear coat that’s used? The material feels more rubbery. Thanks for all your tips – this is the only source I’ve found that clearly walks you through the steps. Thanks for your comments, David, and I hope you’ll post pics of your restored Mercedes CLK wheels. I did not restore that back of my wheels but, like you, thought of it when the stripper removed some of the clear coat back there. I can’t see back there and am not worried about it. I also did not clear coat mine. Waxing every couple of months or so works for me because I keep it in a garage at night. But, I recently had a friend in the auto-detailing business recommend Spraymax clear coat http://amzn.to/2shfa6N. I wish I had done that on my Honda Odyssey wheels which isn’t garage-kept. Please let me know if that doesn’t answer your question. Here they are – I basically bought all the items in your post and followed the procedures. The wheels were a bit trickier though as they are not exactly flat and have a lot of weird curves that were hard to sand with the orbital tools. I tried a dremel but found it too harsh (the feathering you mentioned with the orbital is really key). Also wanted to mention – after researching, I bought this product called ShineSeal, which is really easy to apply to bare aluminum and supposedly chemically bonds to the metal to reduce oxidation. It has good reviews from a number of forums…but time will tell. Top is how I got them. Left is after sanding. Right is after polish. Awesome! Wow, David, they do look a lot trickier, but really really nice job! Must have taken a day or more just for one. I’m sure the flexible pad helped a lot with that. Thanks for sharing your pics and for the tip on ShineSeal. Sound good. Will check it out. Those look great, thanks for the nice write up! I just bought a set of Jeep Moab wheels that are about the same shape as yours were and want to restore them. Do you think the Porter Cable 7424XP 6-Inch Variable-Speed Polisher which is rated at 2,500-6,800 OPM would take care of all the steps or would it not be powerful enough? I would hate to buy something like the Neiko just for the wheels if the Porter Cable would work just as good. I tried with the Porter Cable on one wheel and it actually works pretty good. I also used a flapper wheel sander to get into the lug holes https://www.amazon.com/gp/product/B01M294EQZ/ref=oh_aui_detailpage_o03_s00?ie=UTF8&psc=1. I can’t tell from your pictures but did you go back and repaint the areas between the spokes? Great! No, I didn’t paint between the spokes — I sanded that area and the lug holes with 80-100 grit sandpaper for a machined look and different texture finish per step 5. Spiral sanding rolls/cones on a drill helped a lot before finishing those areas with hand sanding. Thanks for the tip on the flapper. That might work well between spoke too, except in the more detailed areas. Thanks for posting, one more thing on my endless todo list!!!! But while a DIY repair such as Richardson’s is fine for mild damage, you’re probably looking at calling out a mobile wheel refurbishment company to repair anything more serious such as a bent wheel, extensive kerbing, corrosion and fractures. You’ll pay around ?50 per wheel. The advantage is that they’ll do the work at your place and probably in the same day, so you’re not massively inconvenienced. Hey there! Awesome write up. About to attack a set of canyon wheels that I picked up for my XJ for $50. Do you think a dual action polisher/sander would work for this, or is the orbital required to get these results? Thanks for all of your efforts. I went to your amazon affiliate links for most of this stuff. Greg, so sorry for the delay. Congrats on great deal on canyon rims for your XJ. Do you have a link to the dual action unit you’re referring to? BTW, I’ve meaning to post an update that will show how well my wheels have held up with minimal maintenance. Also, be careful not to let harsh cleaner get on the finished wheels, like tire bleach/cleaner that cleans grime off tires, or you may have to polish again. Would love to see pics when done. Excellent job, refinishing wheels is a time consuming task but it gets easier with practice/experience. It’s an inexpensive diy that can be rewarding once completed. To shed a little wisdom based on experience, I’d like to add that clear coat typically doesn’t bond well to smooth or unpainted surfaces, especially ones polished with anything higher than 800 grit, but there are ways (keep reading). However, waxing requires upkeep, regular degreasing and rewaxing (obviously depending on climate, driving conditions and frequency, etc). But if you insist on clear coating your polished rims I highly recommend using adhesion promoter which goes on clear, then use a high quality automotive clear coat (I use the Duplicolor perfect match line regularly with success). Make sure to always follow can directions precisely (typically 2 light coats followed by 1 wet coat). *Tip: you can also refinish extremely corroded headlight lenses with sanding/adhesion promotor & clear. Keep in mind that the clear coat will always leave an “orange peel” finish/texture which is normal and can be polished out by hand with relative ease once the clear coat has properly cured. Wax = slightly less initial work but more upkeep (and arguably a nicer mirror/lustrous finish). Clear coat = more work but less upkeep once completed. Although the clear will eventually corrode and you’re back to square one.